If the saying "A picture is worth a thousand words" then Carol's beautiful photos of the new Gander Heritage Memorial Park are worth millions. The Committee is extremely proud of the accomplishments this year and, although there is still more work to be done and more funds to raise, we wish again to recognize some very special people who have gotten us to where we are today. To all our donors: individuals, businesses, service clubs and Federal, Provincial and Municipal Governments: This would not have been possible without your generosity and support. Can you imagine the donations and gratuitous services to date total more than $430,000.00! If you haven't yet donated, we really need more funds to proceed with the next phase in Summer 2015. Remember us when you need those tax deductions! Our gratuitous services donors and volunteer labourers, especially Bob Janes and Clyde Burt who spent many long hours at the site doing 'hard labour'; and the committee members and their spouses for saving our foliage by watering them morning and night during the hottest, driest July on record. Rev. Wesley Oake for his bravery and dedication in Parachuting from an aircraft at 10000 ft. to support the Park. He has received pledges in excess of $20,000.00 and is still receiving donations! You may still pledge to Rev. Oake by following the "How to donate" section on this website's Donations page and send a short email to Treasurer Joy Janes rajanes@nf.sympatico.ca advising her your donation is for Rev. Oake. On November 11th Rev. Oake was honoured with a certificate from the Knights of Columbus which reads in part: "An Expression of Grateful Appreciation for your Act of Service in Defense of Peoples Basic Rights to a life of Freedom and Dignity". 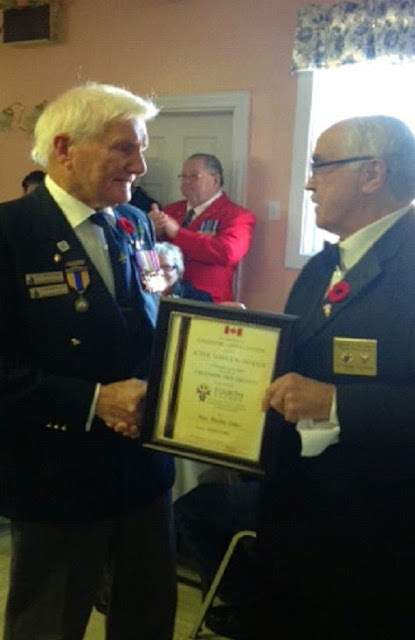 Seen here in the photo below presenting the Certificate is Ed Blackmore of the Knights of Columbus, Gander. We were so very fortunate to have hired Varrick Hillier as Site Foreman. If he was to follow the job description of Site Foreman we would not see so much accomplished nor such beauty. His attention to every detail including doing a lot of the manual labor himself and overcoming many adversities from weather, staffing problems, equipment and material delays, budget overruns, etc. etc. earned him the title of 'Superman'. 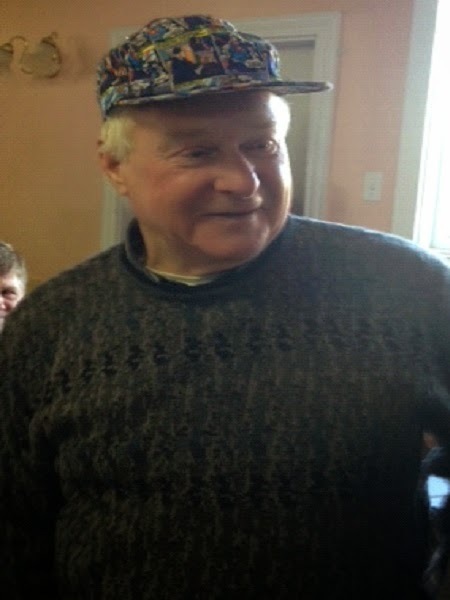 On November 11th we presented him with a Superman hat to replace his hardhat. We are so very grateful to Varrick for going above and beyond and for following the specifications of the Park Architect Dr. Colleen Mercer-Clarke. A HUGE Thank You to the Gander Shrine Club for their donation of $6500.00 to purchase four new flag poles. 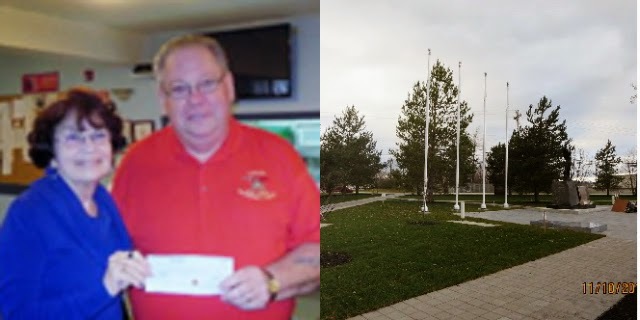 These photos show Eric Murray President of the Gander Shrine Club presenting the cheque to Treasurer Joy Janes and the shiny new flag poles installed at the Park in time for Remembrance Day. This makes a total of $21,500.00 in donations from the Gander Shrine Club. WOW! Diane Davis shared her beautiful photos of Remembrance Day Ceremonies and it should be noted that a record number of participants attended the ceremonies this year. I am sure this was in part due to recent tragic events in Ottawa and Quebec as well as those in Moncton earlier, however, I also feel many people gathered to see the Park as they had been seeing the progress as they passed by every day. Please take the time to see more of Diane's excellent photos and videos by clicking here to visit her website LAZYDAYSNL! 2014 November 11th Remembrance Day ceremonies at the Park in Gander! For those who have purchased Plaza Stones, here is an excellent view of those beautiful Newfoundland granite stones. 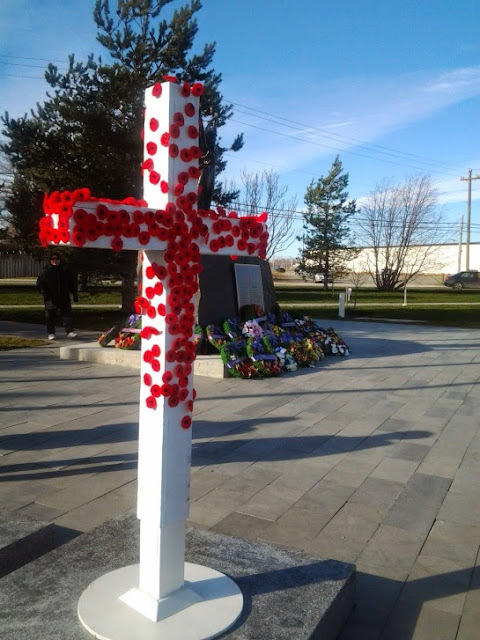 Also, the cross is temporarily placed on Sgt. Gander's granite base. The focal point and main objective of the Gander Heritage Memorial Park is the Monument to Sgt. Gander. Unfortunately the statues of Sgt. 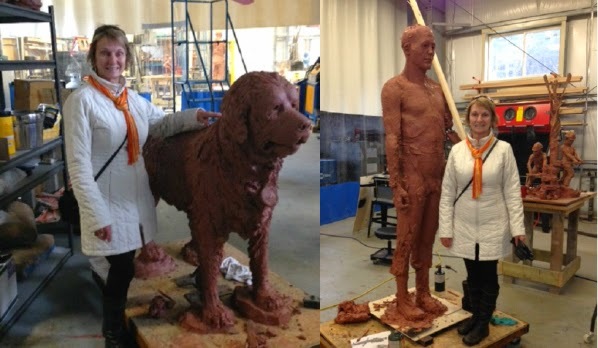 Gander and his soldier/handler could not be completed by this year's Remembrance Day Ceremonies but will be ready and installed early summer of 2015. Committee member Pat Brazil recently visited the Foundry and shared these photos with us. It is easy to see the 'larger-than-life' size of the monuments and also the detail involved in sculpting them. We are so looking forward to seeing the finished sculptures. Although WE think the Park is stunning, we would certainly appreciate hearing from you and ask that you post your comments and opinions on the website or you can email them to committee members Maxine Smith maxine@briggsaero.com or Carol Walsh carol.walsh@nf.sympatico.ca. Thanks for the photo credits. I'm so impressed with the redesign and various tributes in this park. I hope to make a second donation sometime soon to show my appreciation and continue to support the project. Well done everyone.